Last edited by 05BlackF150; 10-19-2007 at 07:50 PM. 6 inch fabtech dl suspension lift with coiolvers cranked 1"
Last edited by bigyellowtruck1; 01-19-2007 at 01:08 PM. Finally, a couple years AFTER putting on mods, I have pics. I dont know why it took so long, oh well, here is one. Still to come, New seat covers, my seats are freakin TRASHED! My advise, if you use your truck, I mean use it like for hunting, etc and/or have kids, get covers ASAP. P.S. GP AND RP, I know, no pics, but I couldnt resist. Its just so beautiful. Maybee you guys should change the name of the thread and take "Photo Galleries" out of it. Last edited by fordabbits; 07-24-2006 at 12:55 AM. Figured I add the new mods. Last edited by Rockpick; 08-06-2006 at 12:01 PM. Well I've had this truck for a month tomorrow!! No lift though!!! Gotta Be able to get it into the Garage!!! Two additional large bins for the overhead rail storage system. Black leather center console arm rest. Last edited by 26point2; 02-06-2007 at 10:32 AM. 2006 SCREW 2 1/2 spacer with centerlines and 305/55-20's. That's it for mods. Last edited by scsmitty78; 09-03-2006 at 11:20 PM. 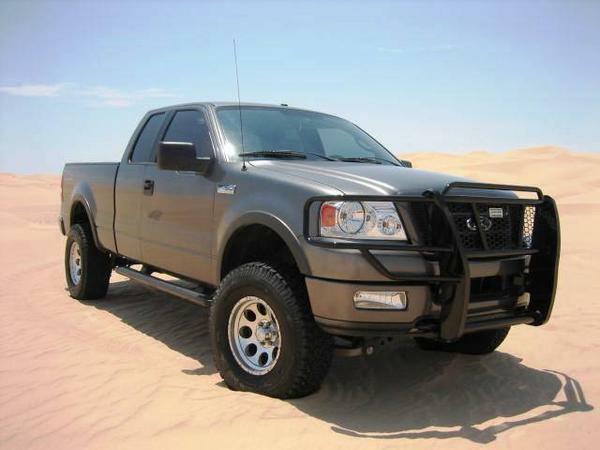 2004 f150 XLT 5.4 w/ 3.55 gears. Troyer Performance Tuned w/ XCal2 and 87 octane tow, 87 and 93 octaone performance tunes. Currently running the 93 octane tune. Custom True Dual Exhaust with X-pipe and 2 SISO Original 40's Flowmasters, Tips out the Back. Last edited by NCSU_05_FX4; 02-23-2008 at 12:14 PM. When my Lincoln door handles get here, I'll install my jimmi jammers and gate keeper. I really like the Fire and Ice light bar. I cut the parking light wire so it only works with brake, turn signal, and reverse. That way, it is more noticeable at night instead of being on with the parking lights. It really makes people back off when you put on the brake or turn signal. The reverse LEDs do not add as much light as I'd like but I still like it. Last edited by EW_; 12-28-2006 at 03:37 PM. Last edited by mcdover; 10-12-2006 at 09:42 PM. 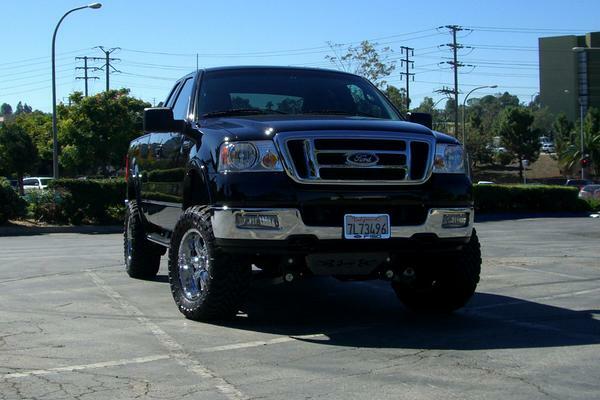 mods: front window tint, window defectors, Truxedo roll up tonneau plastic bed liner,mud flaps SIRIUS Satellite Radio. the best truck i ever bought!!!!!!!!!!!!!!!!! !